The second half of 2017 brought a varied selection of outings for GG. 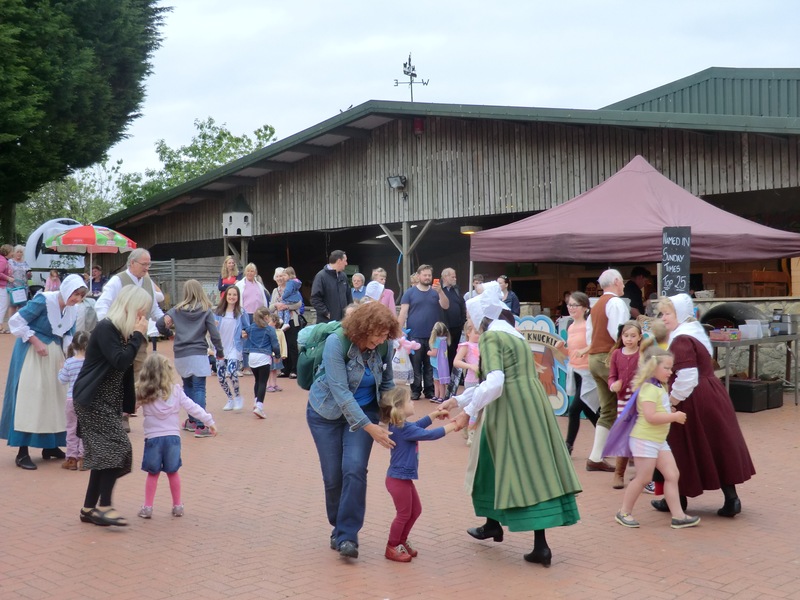 In September, we travelled to Barry and the Amelia Trust Farm for their Harvest Festival Open day, which is the biggest fund raiser of the year. This was a return visit, and the previous year we had danced in June in the sunshine at their summer fete, but unfortunately on 9th September the weather was very changeable and the decision was made to clear a space inside, with some of the craft stalls, for us and the Tai Kwando demonstration that followed us. We displayed a few of our traditional Welsh dances and then got some of the audience (mainly children) to join in with us for some simple ceilidh dances. 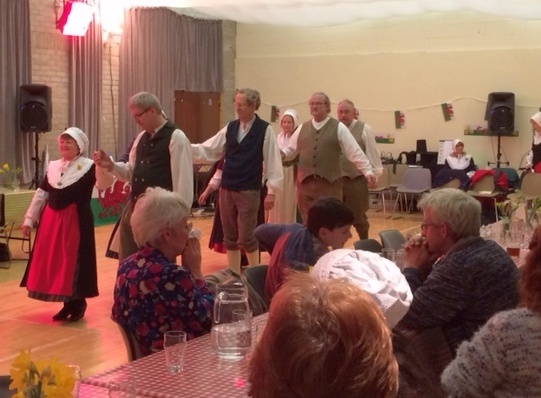 Later is September on 28th we paid a return visit to Risca U3A’s monthly social meeting to give them a taste of Welsh culture, which included some dance displays and a chance for U3A members to join in. The session was once again put together by Barbara Griffiths with dance instructor Ceri, and she was able to re-use that format, translated into Welsh, for an evening at Stow Park Church Centre with Newport Welsh Society on October 20th, and very successful it was too. Before that, on October 17th, we travelled to Shirenewton to the primary school as part of one of the children’s enrichment sessions. The children get to choose which subjects they would like for these sessions, and dance is one of the categories on offer. We gave dance displays to two sets of children, got them to join in, and Barbara interspersed this with some oral Welsh culture. Our final booking of the year came on a very snowy 13th December at Llanhilleth Miners Institute, for Coleg Gwent’s adult Welsh learner’s Christmas party. The evening was very well attended despite the weather, and well respected Welsh folk singer Gwilym Bowen Rhys was part of the entertainment along with GG. Unfortunately, we had to cut short our programme as feeding 120 people took a lot longer than anticipated, and the evening ran out of time. 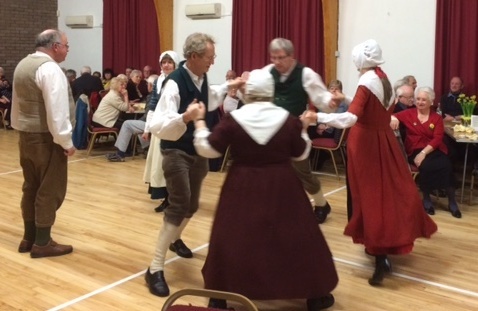 We only had a chance to display three of our prepared dances, and then call just three dances in Welsh for a twmpath (ceilidh) that was supposed to last well over an hour. Disappointing, but as long as the audience enjoyed what we did, we are happy. We hope to be invited back this year when hopefully the timings will be better. Gwerinwyr Gwent would love to recruit some new dancers, especially men! Welsh dance steps are basic and few, it is just the patterns of the dances that need to be learned. We would also be very pleased to encourage extra musicians to join our little band. Practice night is Thursday 8-10pm at the Graig Community Hall, Bassaleg (opposite the Ruperra Arms). Either just come along, ring 01495 271953 for more details, or check out our website www.gwerinwyrgwent.org.uk or Facebook page.